What behaviors, actions, and accountabilities will be necessary to support our future desired outcomes? What kind of leadership and organizational support would help? What specifically do we need from _____? Are there specific things that would need to change to bring about desired outcomes? If so, what are they? Is what we’re doing really addressing the important (versus the urgent) within our department? 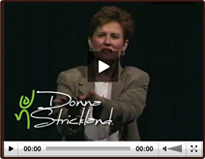 Posted by Donna Strickland in Free Resources, Leadership and Team Development. 1. Find out whether the person you are working with is interested in seeing problems as learning opportunities. If so, when a problem occurs, include other people who are also interested in the situation. Other people’s perspectives can be helpful because often two people in conflict are actually mirroring the conflict of a larger system within the organization. 2. Create a setting that is conducive to learning. Allow plenty of time to address the issues. Reaffirm with each other that the goal is to learn, not blame. 1. Considering your entire time as an employee at your organization, can you recall a time when you felt most alive, most involved, or most excited about your involvement in the organization? What made it an exciting experience? What gave it energy? What was it about you — unique qualities you have – that contributed to the exchange? Who were the most significant others? In what ways did your organization contribute to the creation or support of this exchange? What were the most important factors in your organization that helped to make it a meaningful experience (e.g. leadership qualities, structure, rewards, systems, skills, strategy, relationships). This article addresses the fundamental and dramatic changes that case managers must undergo internally to keep pace with a rapidly and radically changing work environment as we move into the next millennium The work paradigm is transforming from a model of well-defined job descriptions and clearly articulated career ladders within organizations to a fluid workforce in which individuals must now view themselves as a mobile portfolio of skills responding to particular needs within organizations ‘Hence, case managers must retool their thinking, unlearn old beliefs that hinder success, and learn to manage their careers as micro-businesses within their organizations. This new model is founded on self-responsibility, entrepreneurial aptitude, vision and personal empowerment. Taking charge of one’s career and consciously directing it is a dramatic departure from the norm for most individuals. Posted by Donna Strickland in Articles, Free Resources. LET GO, LAUGH, AND LIGHTEN UP! This article examines physiological and psychological benefits of laughter and humor. These are essential tools that can successfully combat the stress and pressure of the preoperative environment. Used in tandem with ‘life balancing skills,’ they can enrich the work arena and help nurses rekindle passion and meaning in their lives. You turn a corner in the hall only to witness one of the most infamous, degrading, and most cliched scenes in the hospital: an arrogant, self-righteous surgeon is screaming at an OR nurse about something so ridiculous it would be laughable if it were not so infuriating. Your own blood pressure escalates as you walk by, but then something amazing happens. You hear the voice of your colleague, a genteel Southern woman, say in a slow Alabama drawl, “Pardon me for interrupting, doctor.” The neurosurgeon is so stunned by this audacious act that he stops screaming. Joseph Campbell said, “We are here to participate joyfully in the sorrows of the world.” I call my friend up on the phone. She’s been hard to get…distant…running scared. Her mother was buried three weeks ago. “Can you meet me at Dairy Queen? We could get a yogurt. You don’t have to talk. I just want to see the whites of your eyes.” Silence. A deep sigh. “Okay, I’ll meet you there,” she whispers. We meet. We stand in line for what seems like forever, with children laughing all around us. We watch them silently, old friends, Deb and I. Our eyes glisten. It was only three months ago that the foster child she’d had since birth had been given back to the biological dad. Seems like too much to happen to one woman in such a short amount of time. When your workplace is reorganized–again–take time to reevaluate your personal mission and desires and bring them to life. You know that being in the health care industry is like riding a roller coaster that just won’t quit. Everyone who is connected to this business has felt her feet fly out from the safety of terra firma, has been turned upside down and sent speeding through lightning quick changes on a ride that seems to be moving too fast to get off. You barely implement new directives when a counterrevolution is led by the next team of experts. Your survival instinct tells you to hang on for the ride. Hanging on is a good place to start, but it’s only a first step–a primitive defense mechanism designed to let you get your bearings. As the old psychological contract between individual and organization continues to unravel, many of us are trying to figure out how to lead, provide motivational environments and plan for the future in this uncharted and “permanent white water” work environment. Being a 21st Century Leader requires new behaviors and new learnings. I will identify some of these new leadership skills in this paper. The leader’s ability to learn how to learn, along with his/her values, self-insight and helping skills are the foundation of productive “new world” organizations. Following are 7 Keys to 21st Century Leadership. Learn how to facilitate transitions…constant rapidly changing transitions. Know the difference between change and transition, know the 3 phases of transition. Know specific intervention skills for each phase. The primary leadership task for the 21st Century is harnessing the human spirit to help customers. You are scrubbing for the next procedure when your pager goes off. It is the day care center letting you know your son is sick and needs to be picked up. Next, your boss stops by to say your committee meeting has been changed to 4 PM–the same time as your daughter’s soccer game. Meanwhile, you are thinking about where your ATM card could possibly be and where you will find the cash to go out for lunch. No need to worry if you cannot eat out–you can wait until tonight’s dinner plans with friends. Unfortunately, you do not really like these friends much, but you feel obligated to go because they made a nice contribution to your church’s annual silent auction.